WELCOME TO THE BOAT-BOARD “HOW TO ORDER” PAGE!!! This page is dedicated to explaining ordering instructions for the Boat-Board.com STEP AND HANDLE, the ultimate solution for safe, easy, and fast boarding of high bow boats on their trailer. 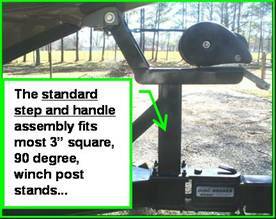 · The standard step and handle assembly will fit most 3” square winch support posts that are completely vertical (90 degrees or perpendicular to trailer frame). The majority of high bow boat trailers have this set-up but not all do. Pictured to the right is a typical winch post stand the standard Boat-Board.com step and handle will normally fit. 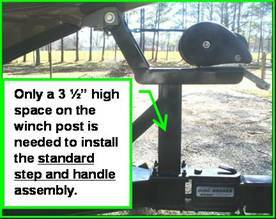 · If your trailer doesn’t match the set-up shown for the standard step and handle assembly, then you MAY require a “custom” application. · Due to the almost endless boat/trailer combinations out there, we are continually working on NEW step and handle design configurations to help our customers (see NOTES to right). · Please send us an e-mail at boat_board1@yahoo.com if you have questions or think you need a “custom” step and handle designed and built for you. Please send us an e-mail request to boat_board1@yahoo.com (boat_board1@yahoo.com) with your name, shipping address, your boat make and model, your trailer make and model, & which product you think you may need (standard step and handle or custom application). Including a picture of your trailer’s winch stand, shot from right side with tongue & boat bow in the frame (similar to example picture to right), would be very helpful to ensure proper fitment to your rig. If you don’t have access to a digital camera or can’t send pictures with the e-mail just let us know and we’ll work it out. We will reply with a total price quotation, ground shipping included inside continental U.S., and estimated delivery date (based upon receipt of payment). Methods of payment accepted; certified or cashiers check, or money order. Remember, there is no such thing as “too much information” when describing your trailer/boat combination to us. This helps us make sure you get the right product. We will do all we can to meet your needs! 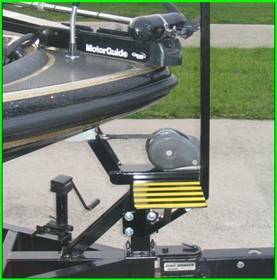 NOTES; The standard Boat-Board Step and Handle fits most OEM boat trailers with 3” square 90 degree winch posts stands, similar to the Nitro 911 CDC pictured below. NEW 2009 designs also include late model Ranger Trail trailers with Ranger Z and 5** series hulls AND Stratos or Champion boats and trailers…the list of satisfied customers continues to grow!!! PLEASE LET US KNOW IF YOU HAVE AN APPLICATION WE CAN HELP WITH…STANDARD OR CUSTOM DESIGNS…WE WANT TO EARN YOUR BUSINESS!!! Below is the Boat-Board Step and Handle installed on a Nitro 911 CDC!! !